Alex Waterhouse ’20, a key member of the Dartmouth Climbing Team, has competed for the Great Britain national climbing team and placed near the top in several national and international climbing competitions. How did you get involved in climbing and climbing competitively? AW: I started when I was 11, when I first started secondary school in the U.K. My dad bought me a chalk bag for Christmas and I never looked back. We started competing straight away. I started competing in local competitions. My first run, I did okay but didn’t make national finals. But I was really excited and wanted to train more. At the end of that year, I went to my first national competition, which was a really good learning experience and really cool. For the next two years, I was on the edge of being able to compete nationally. I was doing well in the British stuff, but not overall. In 2010, I got selected to the national Great Britain team, and I started doing international competitions for like six years after that. What was your experience like doing those international competitions? AW: It was really cool. I traveled a lot in between competitions, so I saw a lot of places in Europe and other countries. I went to Canada, and I’ve been to Italy and China and New Catalonia, so all of those were very cool experiences. What's been your favorite moment from international competitions? AW: One of my favorite moments is competing in my second-to-last championships. Climbing is made of three disciplines: boulder, lead and speed. Bouldering is like lower-level stuff, more powerful, dynamic, it’s all about getting to the top. Lead is longer stuff, like 50 moves long, all about how far you can go. Speed is racing on a preset route. They had the combined competition for all three of those for the first time in the championships at the competition in Italy. I was basically competing for a whole week against the best people in the world in every discipline, and then going into every competition tied already was wild and unexpected. Really cool to experience that four years before they will be doing that for the medals of the triathlon for all three in the 2020 Olympics. Which discipline do you focus on? AW: I mainly compete in bouldering. I made final of U.S. Nationals last year and placed third in the collegiate level in bouldering. One of things I’m trying to do this year is broaden out beyond bouldering. What’s your mindset going into collegiate nationals this weekend in Texas? AW: I kind of know what’s it all about, since I competed last year in bouldering. But the format doesn’t lend itself well to doing well in all three disciplines. The competition is over two days, so you do all of your qualifications for every discipline in one day, and then all the finals for the competition on the next day. And you have to perform consistently well across all of them, and that’s quite an undertaking. It’s going to be a lot more focused. I have a lot more of a plan going in than I normally would. Most of the time, I would meander around and do what feels right. But this time, I have a rigid regime of what I have to do in such a short amount of time. 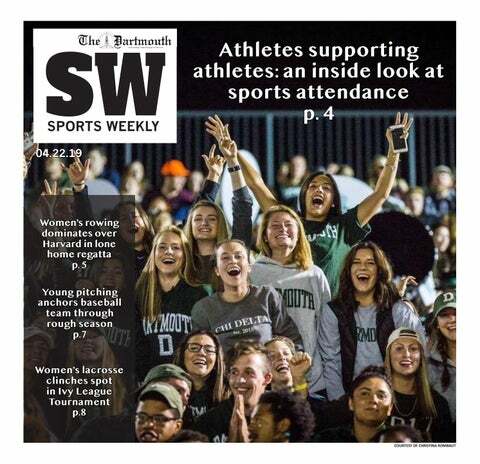 What made you choose Dartmouth? What has the transition been like? AW: I was in a program in the U.K. that took us out to the U.S. that visited a lot of colleges in the Northeast. The goal was to get low-income state school kids to colleges in the U.S. I didn’t know what I wanted to study, so I didn’t want to have to choose and do four years of that in the U.K. I decided that all the top U.S. universities would have comparable academics and come out with a similar education. So I was like “Okay, where’s good for climbing?” Dartmouth has a gym on campus. We have Rumney, which is one of the best climbing locations in the U.S., just minutes away. There’s bouldering in the woods everywhere and there’s a really cool Northeast climbing community as well as a Dartmouth-specific climbing community. One of the big things that Dartmouth has gained in the last few years is the climbing team, which has grown significantly since Matt Rube ’19 and Kayla Lieuw ’19 started it two years ago. Last year, we sent two to compete in nationals and we came in ninth, which is wild. We beat the Texas teams, who had like 50 people, just with the two of us. This year, we’re taking out 10, and we have an influx of strong freshmen. What is the community like in the club? How would you describe team chemistry? AW: There’s two distinct subsections: the DMC, which is like outdoor climbing. It’s amazing in the fall and the spring, when people are driving to Rumney three times a week and you can get on there. And then there’s the climbing team, which is indoor-focused. We train in the climbing gym four times a week, and our goal is to compete in local, regional and national competitions. We’ve taken in a lot of people who’ve climbed very little and their progression over the last few terms has been ridiculous. Everybody’s really good friends, it’s a cool social group. It’s cool to see how that’s been grown out just from climbing and hanging out the gym. What are some of the club’s goals moving forward? AW: We want to win more regional stuff next year. This year we won one-third of the regional championships. We want to become a top-five team in the U.S. We’ve got some great ’22’s going in that I already know, so I definitely think it’s a doable goal. What is the most challenging aspect of climbing? AW: Climbing is 99.9 percent failure. You fall out a climb 50 times before you can do it consistently every time. It’s like working toward one final goal, it takes so many incremental goals. The whole point is those big moments, but it’s the work that leads up to it that makes it as good as it is. How has your mindset on climbing matured or changed over the years? AW: I used to be a lot more competition-focused. I’m still very competitive, but more in trying to improve myself rather than beat other people. I was always very focused on how everyone else was doing, how everyone else was climbing and training. I was always training as hard as I thought everyone else was training, which was probably harder than they were. Now I’m really focused on improving against myself. I know that if I get better each year, I will be much better than I was. That’s become an internalized goal. I feel like I enjoy climbing for going out and enjoying the movement and trying really hard moreso than going out and having success, which makes it easier since I’m enjoying the process more. What are you goals for the rest of the season and next year? AW: Nationals this weekend is selection for University World Championships in Slovakia in June, so the top five get selected for that in each discipline. I hope that I’m fit enough to qualify for that this year. I’m also competing in the British championships in June. I’d like to make top six and finals there and then compete internationally next year. What are your long-term climbing goals? AW: I want to keep climbing and travel a lot more, go to places nobody has gone to before, do things that nobody has done before, do things for the first time. Those are things I’m really looking forward to pushing in the future. Right now, I’m focused more on performance and getting stronger since I know that I’ve been on the edge of success in a lot of recent competitions. How have you been able to balance academics, social life and climbing? AW: It’s a challenge that everyone at Dartmouth faces in some form or another. Academics always has to be a high priority, even though it isn’t always number one. Social life is one of those things you have to sacrifice to train 20-25 hours a week. Training at a high level and alcohol don’t mix particularly well. You have to make some sacrifices. I also manage the climbing gym which is a big time commitment too. All of those things add together and suddenly I’ve got no time. It’s definitely difficult.